Esoterica Ltd. was made up of two people: Dan J. Drescher and James P. Curran. Big City Slick Tape 3, w/ Great American Jigsaw (Apr 1982) This game gives you topographic features and asks for major cities. Red, White and Blue graphics for a patriotic feel. Bomb Squad Tape 2, w/ Wildcatter (Apr 1982) A bomb has been discovered at police headquarters. In order to disarm it you will need: the eye of an eagle, the steady hand of a brain surgeon, the deductive powers of Sherlock Holmes, and the heart of a Kamikaze pilot. Oh yes, you will also need BADCOR (Bomb Analyzing Disposable Computerized Robot). Can you diffuse the bomb before it blows up? Fox & Hounds Tape 4, w/ Treasure Island (Dec 1982) Fox & Hounds is a classic new version of an old game. It's you with 4 pieces against the computer with only one! Move 'checkers style' to prevent the computer from intruding your territory. We guarantee that you will not beat the computer twice in a row. Garbersville Tape 5, w/ Ten Pins (Apr 1982) GARF is attacking Garbersville! You are the only hope for defense of its good citizens. Will your missiles intercept his bombs in time to save this strategic outpost? Great American Jigsaw, The Tape 3, w/ Big City Slick (Apr 1982) Everybody knows where California, Texas and Florida are located, but can you identify the state which the computer has selected at random and drawn in the lower left hand corner of the map? It is surely easy with seven choices from which to pick, but if you really need help the computer will assist you by showing its exact location. 10 pts for the geographer and 5 pts for the duffer. We give you the three easy states and the other 45 go together like a jigsaw puzzle. Hangman Tape, W/ Home Budget Keeper (Dec 1982) Tom Dooley awaits the gallows and only you can grant a reprieve. An educational game of spelling, complete with graphics, three playing modes and music. - Paul Thacker says, "This is definitely a good version of the game. It's got nice graphics, with a pre-drawn background similar to some of the later L&M programs like Alien Invader. There are different options, including letting a second player input words. It even plays Tom Dooley when you lose!" Home Budget Keeper Tape , W/ Hangman (Dec 1982) This complete home budget program allows you to store twelve months of finacial records on a single 60 minute cassette. - Paul Thacker says, "This is by George Moses, but released by Esoterica. There is currently a version on-line from Astro-Bugs Club Tape #1. Pay attention to the loading instructions on this, as they are unusual." - Position the player to hit the ball in the desired direction to reach the hole. The further away the player is from the ball, the harder the stroke. There are a set number of strokes for each hole. The hole will advance if limit is reached. - Simple and playable best describe this game. The choice of screen colors could be hard on the eyes (TV/Monitor depending). Fortunately, the colors are not set in game. I suggest setting BC=7 before play (BC=7:RUN [GO])." Star Trek (aka Starship Command) Tape 1, w/ Mini Golf (Apr 1982) You are sitting at the helm of the 400,000 metric ton starship looking through the front viewing screen into deep space. It is a weary ship. You have already destroyed a Klingon outpost and have just done battle with a Class 1 cruiser. Suddenly a siren sounds "Red Alert." "Klingon Battle Cruiser" flashes across the sensor read out and suddenly the vessel appears on the screen, very small at first, but getting bigger as he approaches. He's attacking at Warp Factor 6! Before you react, the enemy fires! An alarm sounds! Engineering reports the hit damages the photon torpedoes. The forward shield is still weakened from the last battle. Another blast fills the screen as it's about to hit. You must act quickly! You are not yet in phaser range. What will you do??? Tape (Oct 1982) Super Slope. "They called him Super Skier though he'd never had a lesson..." And now you take up where he left off. Super Slope is a super skiing program from Esoterica. No experience is necessary. Great fun! (In Smooth Action Machine Language Graphics)"
This is a downhill skiing game. Simply avoid the rocks and trees. Try to get the fastest time. As the game loads, first the animated title will load and run. Do not stop the tape (or pause the audio). When the title screen is finished drawing, the bottom of it will disappear and what looks like "garbage" will start filling the left and right sides of the screen. This is actually the assembly language program (allowing four colors). 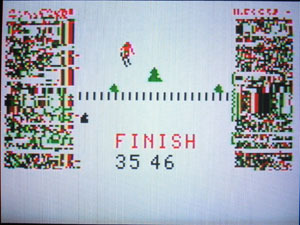 It loads the game, leaving a central corridor for the game to play in. The instructions claim that this "garbage" is "arm waving fans," in effect the machine language is meant to be an audience on either side of the skier. Archive Notes: The "AstroBASIC" cartridge is needed to load the program, but Super Slope can actually run with the cartridge removed. The archive includes a review of the game. Ten Pins Tape 5, w/ Garbersville (Apr 1982) Ten Pins - an exciting game of bowling complete with hook ball, gutter balls, AMF style pinsetter and every spare situation found in real bowling. Treasure Island Tape 4, w/ Fox & Hounds (Apr 1982) You have just been given an old pirate map. Somewhere on the map is the spot that marks the hidden treasure. You must take turns with an opponent uncovering the clues that will lead you to the riches - but watch out for the "pirate attack!" Will you be the first to claim the reward? - Program listing and instructions in Cursor, Vol. 2, Page 96-97. Wildcatter Tape 2, w/ Bomb Squad (Apr 1982) All the excitement of the old time oil wildcatters! Take charge of your small company as you explore for oil. Study the geological date, calculate the risks, and make the smart investment. You could become a wildcat millionaire! Computer gives all necessary data for one to four players. Keeps the running account of income and expenses right down to the dollar. Full graphics and sound.